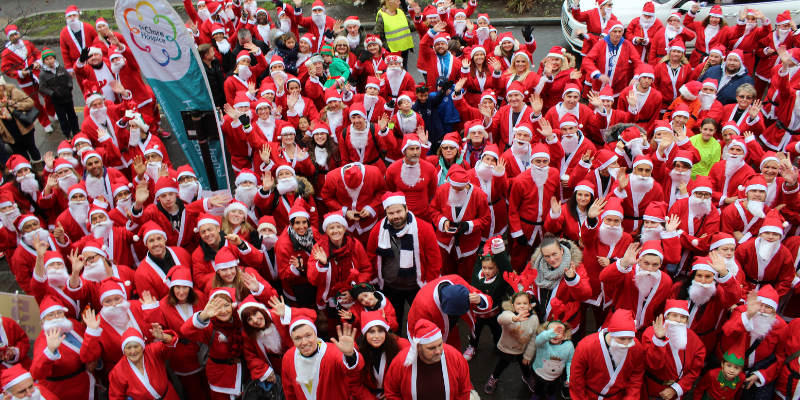 Dash through the streets at the Debden 5k Santa run, returning this December! Are you ready? Have you ever felt like joining a group of two-hundred Father Christmases and Santa-bombing your local town during the festive season? If this sounds like you, then by happy coincidence your Santa-bombing dreams could all come true as St Clare Hospice hosts its 5th annual Debden 5k Santa Run once again! St Clare’s 2018 Santa Run will take place on Sunday 2nd December 2018, and as usual will begin with a giant Santa meet-up at 12pm outside Geraldine’s Hair Fashions hairdresser on The Broadway in Debden. With the race taking place at 12.30pm, this annual yuletide fundraiser promises to be a ho, ho, whole lot of fun – with spectators welcome to view this sight to behold! Hundreds of hospice supporters clad in Santa outfits will take to the streets of Debden to spread the festive cheer and raise vital funding for St Clare. Last year, the event raised almost £9,000 for St Clare, after the event has been steadily growing in popularity annually for the past 4 years. This family friendly event is open to all. Entry is £12 for adults (includes a Santa suit) and £5 for children. Enter as a team of six for £60. Geraldine’s Hair Fashions is located at The Broadway, Debden, IG10 3ST.